John Boehner, Republican Study Committee: Stories of the conservative purge. 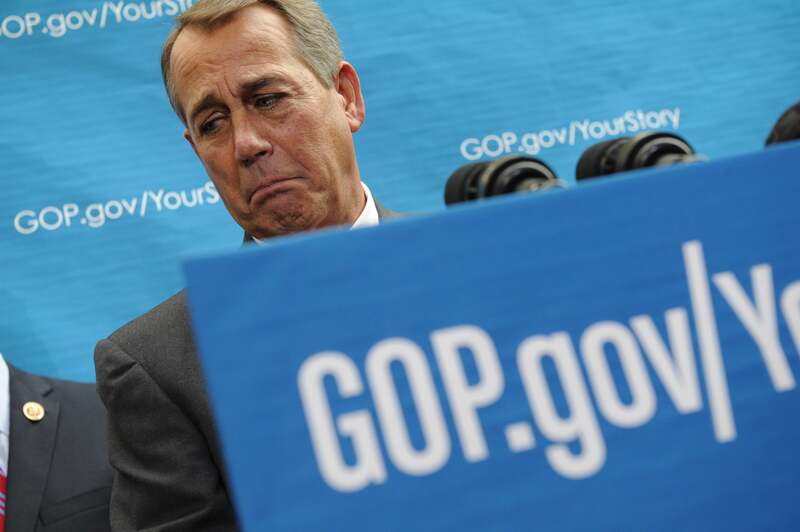 We can trace John Boehner’s loss of his conservative wing to the end of 2012. The “fiscal cliff” was looming. (Cliffs can loom, right?) Boehner wanted his Republicans to pass their own relief package without Democratic votes. * Just enough Republicans opposed this to scuttle the deal; power moved over to the Senate. And throughout 2013, when deadlines rushed up, Boehner’s Republicans were utterly unable to pass a fiscal plan without Democratic votes. The rather unexciting embrace of the budget conference’s package really might be reversing the dynamic. On fiscal policy, at least, Boehner’s Republicans are trying to cobble together a majority of the majority. They’re ignoring the conservatives; they’re trying to win as many of them as possible, but the success of the bill depends on Democratic support. “This bill wasn’t written for us,” groused South Carolina Rep. Mick Mulvaney today. The conservative wing of the party has clammed up, with no official condemnation of the plan even from the Republican Study Committee. Republican Study Committee Chairman Steve Scalise has fired the group’s longtime executive director, Paul Teller, multiple sources told National Journal. The reason for the dismissal, according to sources familiar with the situation, is that Teller allegedly shared sensitive conversations between RSC members with outside advocacy groups, some of whom hold policy positions counter to the RSC. Allegedly, hell! It was nearly two and a half years ago that Teller was caught strategizing with outside conservative groups that were then demanding total purity from the GOP conference. At that time many Republicans called on the RSC to sack Teller. He survived; new RSC Chairman Steve Scalise, in late 2012, promised to keep him on. That he’s out now is a clear signal from the leadership to the conservatives: Stop playing games with the wolves outside. You want to vote “no,” you count on it being a stunt vote that doesn’t imperil passage. Not that this would help you, endangered Republican. Here’s how the Senate Conservatives Fund responded when Mitch McConnell confirmed he’d vote down the budget deal. *Correction, Dec. 16, 2013: This post originally misstated that John Boehner wanted Republicans to pass a fiscal relief package at the end of 2012 without Republican votes, rather than without Democratic votes.